The objective is to capture all your opponent’s pieces (Pedines and Damas). The pieces move as in Anglo-Saxon draughts, but the capturing rules are strongly formalized. The Pedine (checker) moves by sliding diagonally forward to an adjacent empty square, or by jumping diagonally forward over an enemy piece to a vacant square on the other side. Jumping over a piece captures it. Capturing is mandatory and you must keep capturing as long as possible. Pedines may not capture Damas (kings). Preference must always be given to the longest capturing line. Otherwise, the Dama’s capturing move is privileged. If still equal, then one must give preference to the greatest piece value in the capturing line. Pedines promote to Damas on the back row. Damas may move and capture forwards or backwards on the diagonals. Stalemate is a loss. In Italian Dama the board is rotated 90 degrees. 1. Can Pedines capture backward? No. 2. Can Damas move any number of squares? No. 3. Must you choose the move capturing the most pieces? Yes. 3a …and if even, give precedence to a Dama’s capturing move before the capturing move of a Pedine? Yes. 5. Must you give precedence to the capture of two Pedines to the capture of one Dama? Yes. 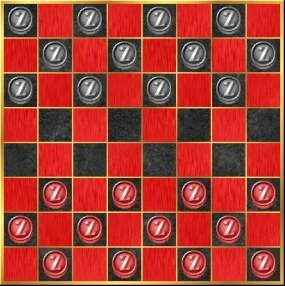 Draughts (checkers) has been played at least since medieval times. It is believed to be derived from the Arabic game Alquerque (here). By way of combinations one must try to attain material advantage, by exchanging one piece for two, or two for three, etc. A good way to get a feeling for the game is to watch the computer play. It is important to value the properties of each piece. A good strategy is to try and get the first Dama, because this piece will cause a lot of damage to the opponent, provided he cannot capture the Dama quickly. Try to hinder the opponent from getting a Dama, by keeping your lines closed so that he cannot break through. Pieces that are moved forward too much are fragile. Rule of thumb: try to keep your side organised in effective blocks, instead of spreading them out in many isolated pieces. You can download my free Italian Dama program here, (updated 2006-07-01) but you must own the software Zillions of Games to be able to run it.